The animals’ former owner was barred from owning any dogs. AN ELDERLY WOMAN has been ordered by a District Court judge to refrain from owning any dogs after a number of animals had to be put down when they were rescued from her care. A Waterford District Court judge ordered that Anna Butler (78) of Hillview, Waterford City, “refrain from purchasing or having in her possession, or under her control, any dog”. Butler (78) had pleaded guilty to failing to safeguard the health and welfare of nine dogs in August 2016. A statement from the Irish Society for Prevention of Cruelty to Animals (ISPCA) detailed the events surrounding the rescue of the dogs. Responding to a call made to the ISPCA helpline, inspector Alice Lacey visited Butler’s home and found nine Wheaten Terrier dogs living in poor conditions in the back yard. Lacy said that the conditions the dogs were in were terrible and the yard was covered in faeces. “The smell was so overpowering and there were flies everywhere,” said Lacey. The dogs had no water or dry area to sit down. 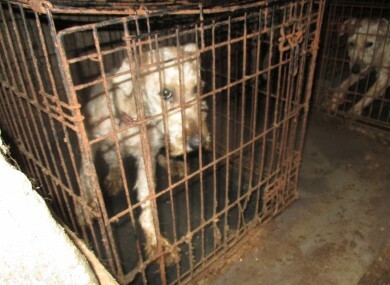 Most of the dogs were confined to dog crates and they were soaked in their own urine. One dog was squashed into a dark pen that had a concrete block covering the door. The dogs were signed over the ISPCA. Veterinary examinations found two of the animals were severely emaciated. Another dog had a burst ulcer on its face, while others had very poor teeth. The dogs were extremely aggressive and in very poor health. On veterinary advice after a number of consultations the decision was made to put the animals down. The judge took into account Butler’s age and health when making his decision. He barred her from keeping dogs and fined her €100 and ordered her to pay €697 in veterinary costs. Butler had been a member of the Irish Kennel Club who has a long history of breeding Wheaten Terriers. Email “Seven dogs had to be put down after being found in 'deplorable' conditions”. Feedback on “Seven dogs had to be put down after being found in 'deplorable' conditions”.